Recent weeks have brought the onset of winter. It won’t be long before I start dusting off the wire traces and treble hooks for a few wary winter Pike. Still, as the sun was shining (at least for the moment anyway) and the air temperature didn’t feel that cold, I asked my brother if he fancied catching a few carp from our local fishery, Riverside. This would be a form of redemption for Mathew, who also blanked on our last outing together to Acorn fishery near Clevedon. Today we would be fishing light, searching out the last few feeding summer carp on good old dog biscuits. A bait which is hugely underrated and amazingly cheap! Travelling so light makes setting up easy, and no sooner had I connected a controller float and tied my hooklength to my mainline, I was fishing. I think we had underestimated the effects of the recent cold spell on the fish. Normally a few pouches of biscuits would bring the fish straight to the surface, this time however… nothing. For a few minutes the most active part of the water was the steady ripple moving from left to right. 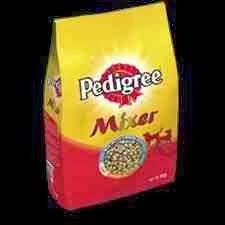 A good handful of a small sized mixer would make or break this session. Lobbing them in and the resulting splash must have stirred the fish into feeding, because slowly the silver fish in the lake started nibbling away. Then after another 5 minutes of waiting, a slow moving black silhouette crept away from the island and very tentatively slurped in a small floating offering. Eyes bigger than his belly and bait bigger than his mouth! I cast out amongst some loose feed and hoped to connect with something much bigger. To my left I heard “Yep!” to see Mathew’s rod bent double. I wasn’t at all jealous…. 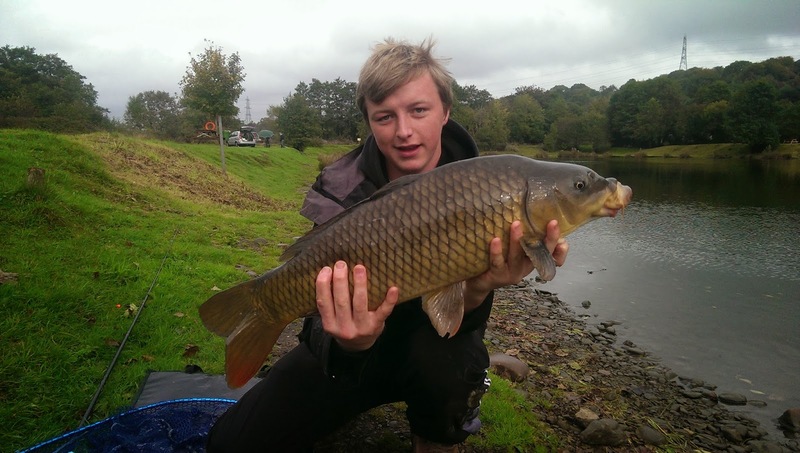 He was in to a nice common weighing just over 11lb. Slipping the fish back in the water I noticed a few hefty rocks also in the net! Cheeky bugger! Having re-weighed the net with the rocks, we found it was just over 1 ¾lb. Which meant his Carp was around 9lb. That was more like it! After recently reading a forum post about “the perfect cast”, I somehow managed to position my hookbait within 12 inches of the island and in between 2 feeding carp. I had waited for 2 – 3 minutes without so much as an indication, so when my phone rang I thought I was fine to answer it. As soon as I said “Hello…” a carp came up and gobbled down my hookbait! Wedging my phone between my head and my shoulder whilst striking into the fish, I connected. The fish powered off to the right, and after 10 seconds of playing the fish and nearly dropping my phone, the fish shook its head releasing the hook! I was furious and thoroughly disappointed. 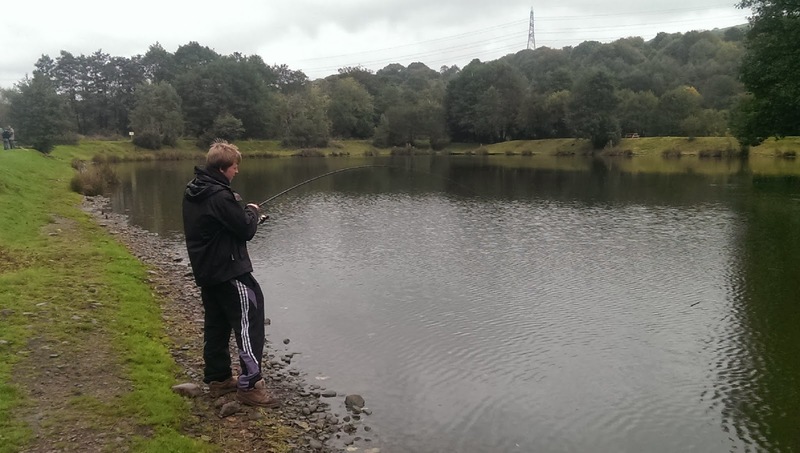 The weather was beginning to change and we noticed that the greater the ripple, the less fish were feeding. It was now taking about 10 minutes between each cast. 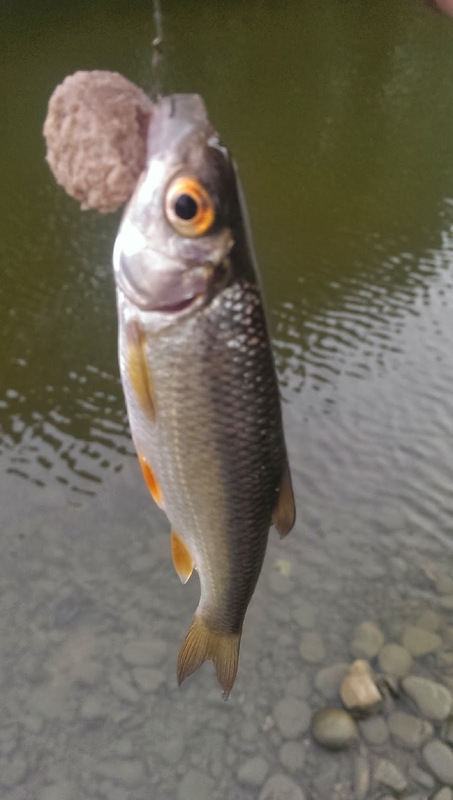 After losing that carp I had successfully managed to hook another Roach on a truly massive dog biscuit. 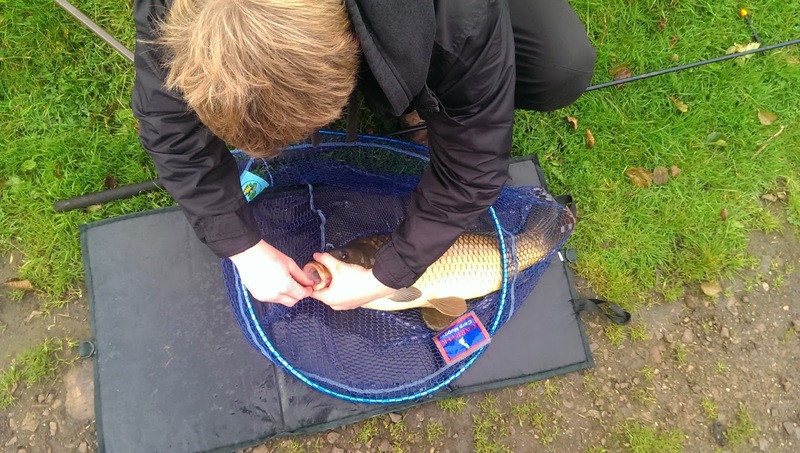 Mathew had managed 3 more Carp, losing a fourth at the net. But we decided to call it a day after 3 hours of fishing. The increase in wind and the decrease in temperature meant that as we packed up, the fish that were previously on the surface were now sat on the bottom of the lake. Surface fishing is such an exciting way to catch fish, I am disappointed that I will have to wait the best part of 6 months before I can try it again. It also has the advantage of using minimal gear, which means you are free to roam around the lake picking off unsuspecting fish, rather than waiting for them to come to you. I will be adapting this minimal gear rule as I target Pike later on in the year. For now I will be carefully packing up my surface fishing equipment until the air and water temperatures creep back up, but one thing is for sure, I will hopefully be exploiting this tactic a lot more during next year’s summer months.